Several people who Rep. Rashida Tlaib (D-Mich.) openly thanked for her successful congressional campaign have posted explicit pro-terror and anti-Semitic content on social media, including calls for violence, such as “kill every Zionist,” according to a report by the Israel Advocacy Movement (IAM). The report reviewed the social-media posts of several people Tlaib personally thanked in a March 31, 2018, Facebook post. Of the five people Tlaib thanked in her post, four have social-media profiles and each one has made posts supporting known terrorists. Ahlam Jbara appears in several photos with Tlaib. She has also posted photos of herself with Rasmea Odeh, a terrorist who was convicted and jailed for 10 years for her role in the murder of two students in the bombing of a supermarket in Jerusalem in 1969. Odeh’s American citizenship was revoked in 2015 because she concealed her terrorism conviction when applying for citizenship. Reema Ahmed, another person who worked on Tlaib’s campaign, “liked” a cartoon in support of Odeh, and wrote a post in search of a t-shirt emblazoned with a large “I support Rasmea” graphic. Ahlam Jbara made the “selfie” photo with Odeh her profile image, called Odeh “an icon for all social justice fighters,” and even baked the convicted terrorist a birthday cake in 2014. Ahlam Jbara also shared a photo glorifying Mohammed Ali, the terrorist who stabbed three soldiers in Jerusalem. Mwafaq Jbara, the second person mentioned in Tlaib’s post, posted “some of the most extreme content,” according to IAM, including hundreds of pro-terror posts. In one post from 2016, he honors Imad Mugniyah, who was the founding member of the Islamic Jihad Organization, a terrorist group, and the second-in-command for the Hezbollah terrorist group. The United States and Israel hold Mugniyah personally responsible for a number of bombings, murders, and kidnappings. In another post, Mwafaq Jbara honors Sheikh Ahmen Assin, the co-founder of the Hamas terrorist group. He also honored Yahya Ayyash, the chief bombmaker of Hamas responsible for the deaths of at least 75 people. In addition to posting anti-Semitic cartoons which call for violence against Jews, Mwafaq Jbara also invoked Hitler’s name in an ominous post from 2014. “Today is for you, but tomorrow will be for us. And Hitler will be a dove in comparison,” he wrote. “Your words are still resonating in my ears and I still remember our meeting of Megiddo in 1997,” Mwafaq Jbara wrote. The next person in Tlaib’s message of thanks is Maher Abdel-qader. Similar to the others, Abdel-qader has posted both anti-Semitic and pro-terror messages on Facebook. He wrote “all respect and appreciation,” in a comment about a photo of Yasser Arafat, the leader of the Palestinian Liberation Organization terrorist group. Abdel-qader also liked a photo of Mahmoud al-Zahar, the co-founder of Hamas. Tlaib awarded Abdel-qader an honorary medal for helping with her campaign. Tlaib is a vocal critic of President Donald Trump. She drew attention to herself by referring to the president using an expletive and vowed to impeach him. Trump is the only president to follow through on a promise to move the U.S. embassy to Jerusalem. Last month, the president recognized Israel’s sovereignty over the Golan Heights. “The incredible bond between the United States and Israel will never be stronger than it is right now,” Trump said in a speech on April 6. 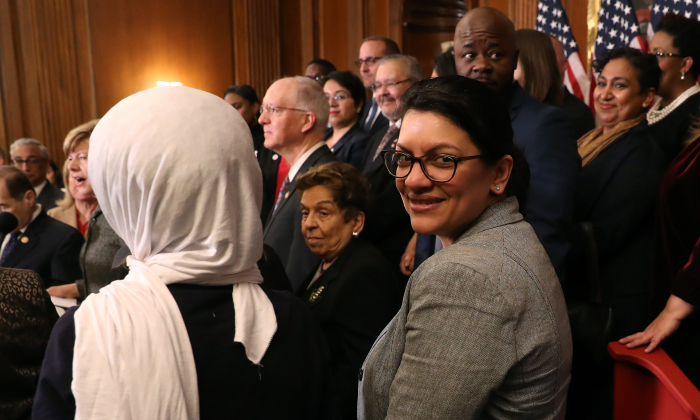 Tlaib made an anti-Semitic remark early in her term in Congress, suggesting that fellow citizens who support the anti-Israel Boycott, Divestment and Sanctions campaign have dual loyalty to Israel. “They forgot what country they represent,” Tlaib wrote on Twitter.